And with a quartet of distinctive models that range from the fun-to-drive and highly fuel-efficient entry-level model (2015 Lancer ES) through to the high-tech turbocharged engine/dual-clutch transmission and extreme agility of the rally racing-inspired edition (2015 Lancer Ralliart), there is a Lancer model perfectly suited to virtually any budget and/or lifestyle. With the 2015 Mitsubishi Lancer – like every model within the Mitsubishi Motors family – safety is always at the forefront of the Japanese auto manufacturer’s engineering and design philosophy. Numerous safety technologies and features have been engineered into the 2015 Lancer including an advanced seven (7) air bag Supplemental Restraint System (SRS) that includes dual-stage front air bags with occupant seat position sensor, side-impact head protection curtain air bags, front seat-mounted side air bags, and a driver’s side knee air bag; anti-lock braking (ABS) system with Electronic Brake-force Distribution (EBD), Active Stability Control (ASC) with Traction Control Logic (TCL); a Tire Pressure Monitoring System (TPMS); front pedestrian impact crumple zones; height-adjustable headrests and three-point seatbelts for all three rear seating positions. Additionally, Mitsubishi Motors’ highly-effective Reinforced Impact Safety Evolution (RISE) energy-absorbing body construction technology has been engineered into every 2015 Lancer model to help provide an additional degree of driver and passenger protection in the event of an impact. Available with a slick-shifting 5-speed manual or a technologically advanced continuously-variable transmission (CVT), the 2015 Mitsubishi Lancer ES is a fuel-efficient vehicle with an EPA fuel mileage rating of 34 mpg highway* (Lancer ES models equipped with the CVT transmission). Making use of Mitsubishi Innovative Valve timing Electronic Control (MIVEC) variable valve-timing to maximize power while minimizing harmful exhaust emissions, the 2015 Lancer ES is powered by a very capable yet highly refined 2.0-liter DOHC 16-valve 4-cylinder engine that has a power output rated at 148 bhp according to federal emmisions figures. A wealth of standard features are included on every 2015 Lancer ES including an excellent 4 speaker 140-watt AM/FM/CD/MP3 sound system; steering wheel-mounted cruise, audio and Bluetooth® hands-free system controls; a helpful ECO indicator light that illuminates to alert the driver when they are driving in the most fuel-efficient manner; air conditioning with micron filtration; keyless remote entry with panic alarm feature; split-folding rear seat; and a 6-way adjustable driver’s seat. What’s more, a new Value Package (CVT-equipped models) is now available for the 2015 Lancer ES that includes Mitsubishi Motors’ convenient FUSE Hands-Free Link System® with a USB port; newly designed 16-inch alloy wheels; soft-touch front upper door trim; chrome interior door handles; high contrast meters with color multi-information display; and rear disc brakes. The 2015 Mitsubishi Lancer SE is a very compelling value as this model includes even more standard features than the entry-level Lancer ES but also boasts Mitsubishi Motors’ exceptionally capable All-Wheel Control (AWC) all-wheel drive system – all at a very affordable price point. Along with the added tractability, handling and control benefits of the All-Wheel Control (AWC) system, the Lancer SE is powered by a larger displacement and more powerful 2.4-liter DOHC MIVEC 4-cylinder engine that is rated at 168 bhp, a full 20 bhp increase over the 2.0-liter engine found in the Lancer ES. The exclusive transmission paired with this fuel-efficient and stout powerplant is the continuously-variable transmission (CVT). Including the full line of features/accessories that come with the Lancer ES model, the all-wheel drive 2015 Lancer SE benefits from additional items including heated front seats, rearview camera, a 6 speaker 6.1-in. touchscreen display audio system with HD Radio® and a 3-month pre-paid subscription to SIRIUSXM® satellite radio; chrome interior door handles; soft-touch front upper door trim and roof carrier plug-in accommodation. An array of standard features have been added to the 2015 model Lancer SE including FUSE Hands-Free Link System® with USB port; high contrast meters with color multi-function display; a stylish color-keyed sport front bumper, fog lights and newly designed 16-in. two-tone alloy wheels. The new-for-2015 color multi-function display provides the driver easy to access and handy data including outside temperature, average fuel consumption, driving distance until the fuel tank is empty, service reminders, plus much more important information. The eye-catching 2015 Mitsubishi Lancer GT offers the best of both worlds with sporty performance and handling along with a number of standard and available luxury features. Sharing the same aggressive-looking front fascia as the premium Lancer Ralliart model, the Lancer GT not only looks but acts the part of a performance-oriented sports sedan, thanks to its sport-tuned suspension and capable 168 bhp 2.4-liter 4-cylinder engine – the identical engine found beneath the hood of the capable Lancer SE AWC model. Rounding out the performance package are the choice between a pair of enthusiast-oriented gearboxes: a precision 5-speed manual or a continuously-variable transmission (CVT), the latter unit featuring rapid-fire steering wheel-mounted paddle shifters. Along with the new-for-2015 white contrast seat and door stitching, standard amenities included on the Lancer GT are a 6 speaker 6.1-in. touchscreen display audio system with HD Radio® and a 3-month pre-paid subscription to SIRIUSXM® satellite radio; FUSE Hands-Free Link System® with USB port; rearview camera; stylish rear wing spoiler; leather-wrapped steering wheel and shift knob; automatic climate control; FAST-key passive entry system with alarm; and 18-in. alloy wheels. A new addition for the 2015 model year is the available Sun and Sound package (CVT-equipped models) that includes a 9 speaker 710-watt Rockford Fosgate® premium sound system; high-intensity discharge (HID) headlights; and a power glass sunroof. 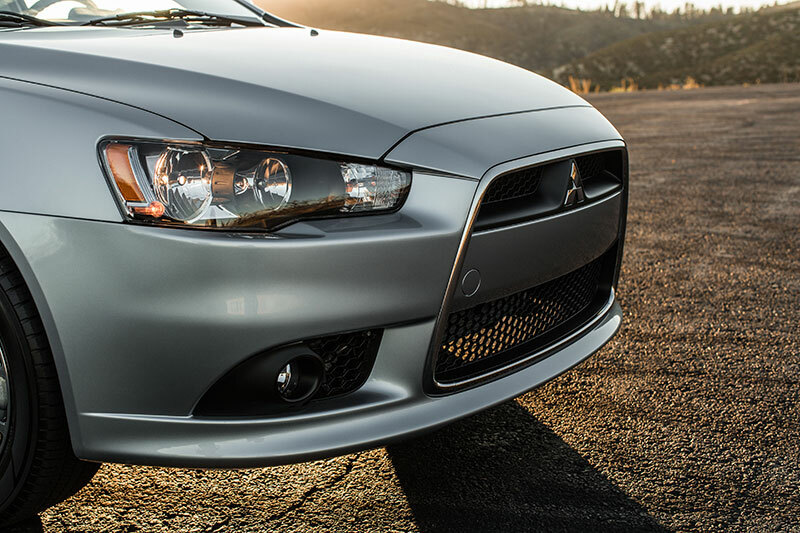 Powered by a slightly detuned version of the engine that propels Mitsubishi Motors’ legendary Lancer Evolution high-performance sports sedan, the 2015 Mitsubishi Lancer Ralliart offers all of the thrills and a great deal of the advanced performance equipment of the “Evo” at an even more attainable price point. Residing under the hood of every 2015 Lancer Ralliart is essentially the same engine architecture of its big brother, the Mitsubishi Lancer Evolution, in the form of a 2.0-liter DOHC turbocharged and intercooled 4-cylinder engine with Mitsubishi Motors’ MIVEC variable valve-timing technology, save for a reduced power output of a still very capable 237 horsepower. An added bonus: the Ralliart’s drivetrain is also fitted with an essentially identical quick-shifting high-tech 6-speed Twin-Clutch Sportronic® Shift Transmission (TC-SST) as that of the Lancer Evolution. The performance-oriented Lancer Ralliart has an EPA fuel mileage rating of 18 mpg city/25 mpg highway. Further aiding the Lancer Ralliart’s highly athletic disposition are advanced driver’s aids including a full-time All-Wheel Control (AWC) all-wheel drive system that includes an Active Center Differential (ACD), rear limited-slip differential and a front helical limited-slip differential. Along with standard Hill Start Assist (HSA) technology and the choice of three different driver selectable modes (Tarmac, Gravel and Snow settings) for the advanced All-Wheel Control (AWC) system, the Ralliart displays excellent handling and tractability on a variety of road surfaces as well as in varying weather conditions. The long list of standard features found on every 2015 Mitsubishi Lancer Ralliart include aluminum foot pedals; paddle shifters; rearview camera; FUSE Hands-Free Link System® with USB port; voice-activated Bluetooth® hands-free phone technology; FAST-key passive entry system with alarm feature; and steering wheel-mounted cruise, audio system and Bluetooth® hands-free system controls; along with many other welcome amenities. Newly-added amenities included in the Ralliart’s standard equipment package for the 2015 model year are high-intensity discharge (HID) headlights with auto on/off headlight control; a sensational-sounding 9 speaker 710-watt Rockford Fosgate® premium sound system; and auto dimming rearview mirror. Every 2015 Lancer model includes Mitsubishi Motors outstanding warranty that is among the very best in the auto industry. Coverage includes a fully-transferable 5-year/60,000-mile (3-year/36,000-mile warranty for Lancer Ralliart) new vehicle limited warranty; a 10-year/100,000-mile (5-year/60,000-mile warranty for Lancer Ralliart) powertrain limited warranty for the original vehicle purchaser; a 7-year/100,000-mile anti-corrosion perforation limited warranty; and a 5-year/unlimited mile roadside assistance program.